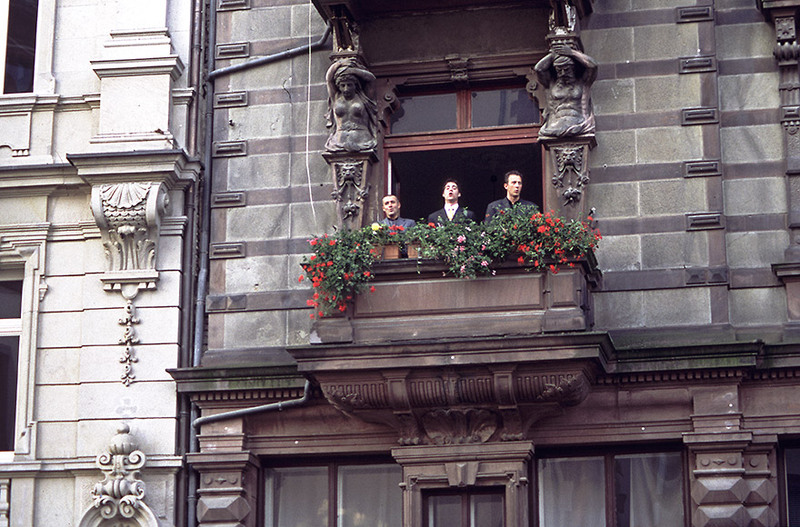 Inter­ven­tion with three men on a balcony covered in flowers on the Wies­badener Rathaus­markt, 24th of August 2000 – 16th of September 2000. 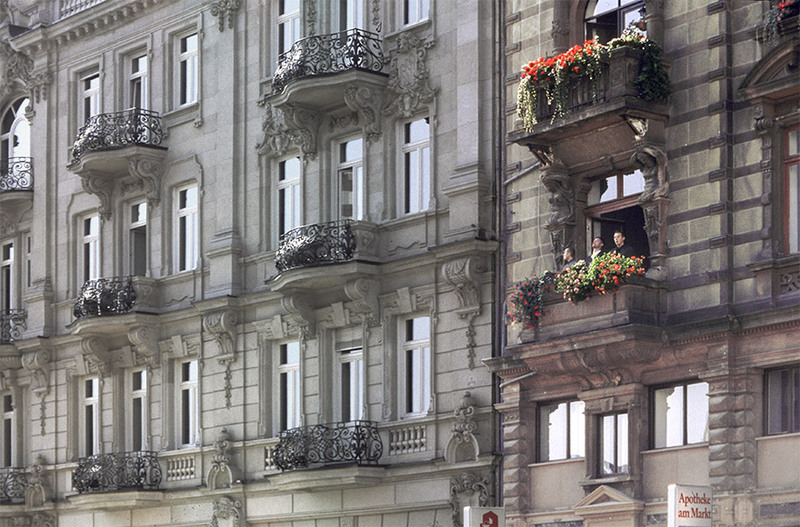 On this balcony in the centre of Wies­baden, Germany, three smartly dressed men appear every day at precisely 8, 12 and 6 o’clock. They stand next to each other at the railing singing for exactly three minutes the song “Wir haben Hunger, Hunger, Hunger, haben Hunger, Hunger, Hunger, haben Hunger, Hunger, Hunger, haben Durst! Wir wollen Cola, Cola, Cola, wollen Cola, Cola, Cola, wollen Cola, Cola, Cola, wollen Wurst!” (We are hungry and thirsty, we want Coke and sausages!). 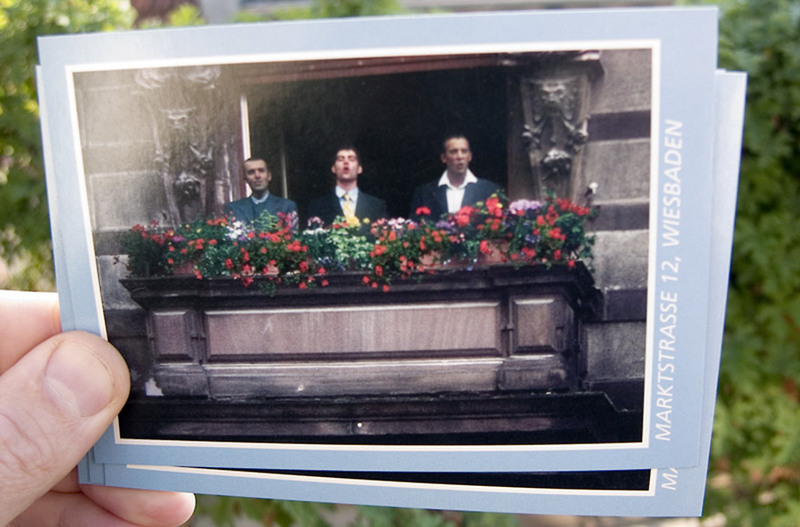 On the post­card stands in the tourist hot spots, such as the spa rooms, the main station, the tourist infor­ma­tion office, souvenir shops and hotels you can find, apart from the post­cards of famous Wies­baden tourist attrac­tions, those which show the three singing men on their flower-clad balcony. There is no other infor­ma­tion apart from the photo itself, the lyrics of the song in German and English and the time and place. The balcony on this affluent square, right next to the town hall and the parlia­ment of the state of Hessen, was once used to make impor­tant announce­ments. Because of the banality of the message, the theme of the announce­ment is reversed—instead of some­thing impor­tant, trivial things are announced. The fact that the message is repeated contin­u­ously, becoming increas­ingly annoying, makes the situ­a­tion absurd: three men step onto the balcony in order to ritu­ally repeat empty announce­ments. The act of emerging and disap­pearing evokes asso­ci­a­tions with towers, muezzins, cuckoo clocks and glock­en­spiels. 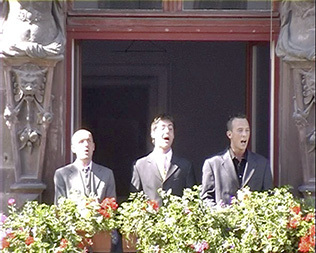 The three singing men create an atmos­phere which remains odd, but still estab­lishes itself at this loca­tion because of the constant repe­ti­tion. The nursery rhyme quoted, which has been known and passed down orally for gener­a­tions, is not an offi­cial song to be found in song books. 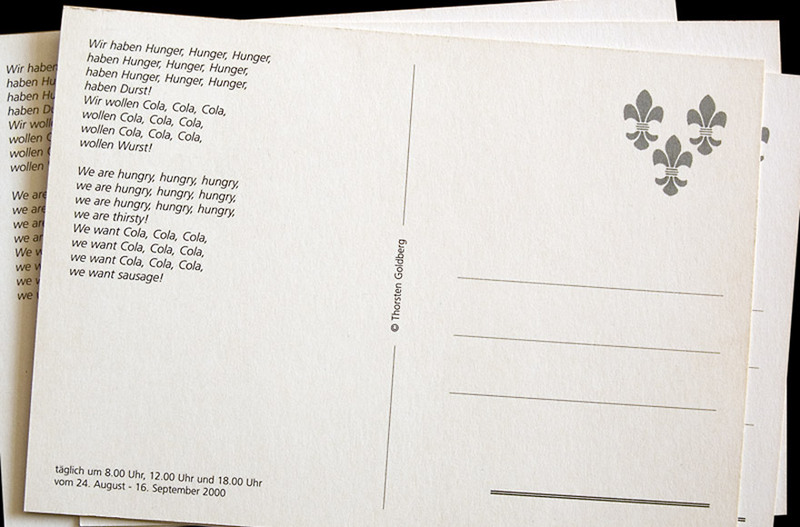 As a harm­less pastiche, it does not stand for real hunger, but for appetite. In Goldberg’s version the men demand “Coke and sausages”, i.e. foods that symbolise affluent soci­eties which are char­ac­terised by an atti­tude of never getting enough or being full. The expres­sion “Hunger, Hunger” which is in fact an exis­ten­tial one, becomes a pastiche play­fully and iron­i­cally coun­ter­acting the cultured satu­ra­tion of the global spa resort.